Even though Arby's has diversified its menu over the years with toasted subs and deli-style sandwiches on sliced whole wheat bread, it's the thinly-sliced roast beef piled high on hamburger buns that originally made this chain famous. Since roast beef and horseradish go so beautifully together, Arby's created this delicious mayo-based horseradish sauce as a spread for the roast beef sandwiches. It also happens to be great on your homemade sandwiches too, but it just isn't cool to hoard handfuls of those blister packs to take home with you. 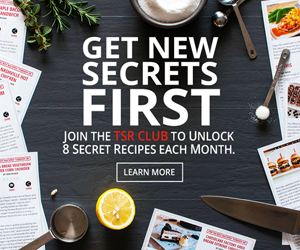 So, with the help of this secret formula, you can clone as much Horsey sauce as you want. First step: get out the blender. You'll need it to puree the horseradish into the mix so that the sauce is smooth and creamy like the real deal. 1. In a small dish, dissolve the sugar and salt in the vinegar. 2. Measure the mayonnaise and horseradish into a blender. Add the vinegar solution, and then fire up the blender to medium speed for about 10 seconds, or until the sauce is smooth. 3. Pour the sauce into a container, cover, and chill it for at least a couple hours to let the flavors get happy. Went to Arby's and asked for horsey sauce and the lady handed me a mitt full. Tastes exactly like it. WOW! 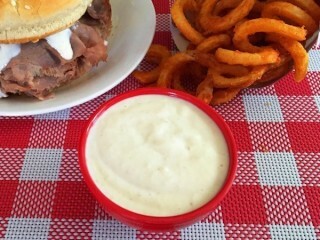 Followed this recipe exactly and the sauce was way to sweet and mayo-y. Added more horseradish until it tasted better which ended up being about 2-3 tablespoons more than called for. Now it tastes like Arby's and not just sweeted mayo.